Happy Fourth of July! I went for a run this morning in the mountains near my house and spent the time thinking about how blessed I feel to live in such a beautiful land. Even when the trail is full of annoying mountain bikers. Even when I kept slipping off the rocks and getting soaked in creek crossings. Even though it was 90 degrees at 8am. Even still…what a place. We’re getting together with friends tonight and doing the fireworks thing–I hope you are too! I’m not doing dessert today, but yesterday I did whip up a quick Fourth-themed dessert. We were spontaneously invited to a friend’s house for dinner, and when I asked what I could bring, they requested something sweet. Um…I have no problem with that. I had about an hour and a half to make it before we had to be over there for dinner, and in that time I made and baked the cake, cooled it, and assembled the trifle. If you use a cake mix the process will be even faster, but if you have the time (just 90 minutes!) 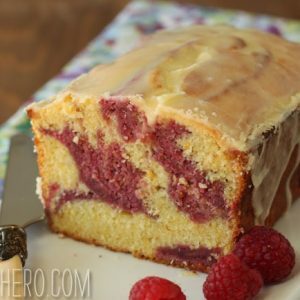 the white chocolate-buttermilk cake recipe I used is ever so much better than a mix. Trifles are one of my favorite desserts, because I LOVE moist cake. Love it. 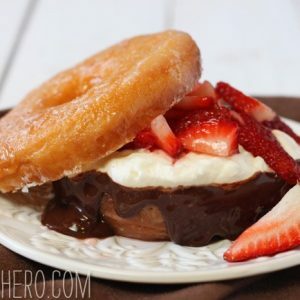 So having a dessert that basically involves soaking cake in whipped cream or curd or pastry cream or juicy berries is my idea of heaven. Plus they’re infinitely customizable, and pretty low-maintenance to make. If you can throw things in a bowl, you can make trifle. 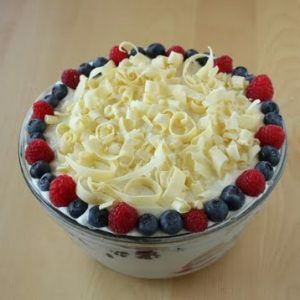 This is probably too late for anyone to make this for the Fourth of July, but summer’s just beginning, and berry trifles are the perfect vehicle to show off all that amazing summer produce. So Happy Birthday, America, and happy trifling, everyone else. To assemble the trifle, make sure the cake is completely cool. Chill a mixing bowl and beaters in the fridge for 15 minutes. While you're waiting for the mixing bowl to chill, chop your berries and toss them with a tablespoon or two of sugar (or more if the berries are very tart.) Let them sit and get juicy. Whip the cream with 2 tbsp of sugar until it forms medium peaks. As you're whipping it, add vanilla extract or the seeds of a vanilla bean to flavor it. Cut the cake into cubes or strips, and place a layer of cake cubes on the bottom of a clear glass bowl. 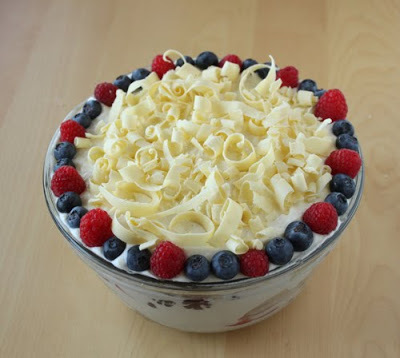 Top with a third of the whipped cream and half of the berries. Add more cake, top with half of the remaining cream and the second half of the berries. Now add a third layer of cake and cover it with the rest of the whipped cream. 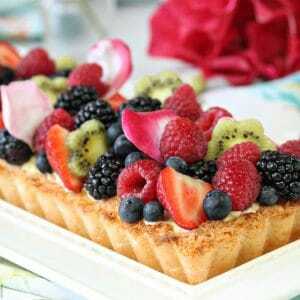 Top your trifle with whole berries arranged in a pattern. If you want to make chocolate curls, take a white chocolate bar and make sure it's slightly soft. Just sitting in a warm room should be enough, or if you need to, microwave it at 50% power in short 5-second bursts just until it softens a bit. Use a vegetable peeler along the sides of the bar to form curls out of the chocolate. Refrigerate the trifle until ready to serve. It can be made up to 24 hours in advance. Place a rack in the middle of the oven and preheat to 350F. Spray a 12 x 17" half sheet pan with pan spray and line the bottom with parchment paper. Spray the parchment. Melt the white chocolate in a microwave safe bowl at 50% power for about 2 minutes, stirring halfway through. Be careful — white chocolate burns easily. Set aside. In a large bowl, beat the butter with 1 1/2 cups of the sugar on high speed for 2 minutes. Scrape the bowl and beaters and beat for 3 minutes more, until the mixture is light and creamy. Whisk 2 tablespoons of the whipped butter into the melted white chocolate until blended. Scrape this mixture back into the butter and beat on low speed until well blended. Add the egg yolks in 2 additions, scraping the bowl and beaters after each addition. Beat in the vanilla. On low speed, alternating wet and dry ingredients, add the buttermilk and flour mixture in 4 additions, beginning with the buttermilk and ending with the flour. Scrape down the bowl. In a large, clean bowl, and with clean beaters, beat the egg whites on medium speed until they form soft peaks. Slowly add the remaining 1/4 cup sugar, continuing to beat at medium speed. Beat until the egg whites form stiff, glossy peaks. Fold half the egg whites into the cake batter, then gently fold in the rest. Pour the batter into the prepared pan and smooth into an even layer with an offset spatula. Bake, rotating the pans from front to back half way through, until golden brown and firm to the touch, about 20 minutes. Remove from the oven and allow to cool completely. I looove trifle, and I just bought myself a trifle bowl, I'll have to try making this one, it looks so good! I don't usually get excited about white cake, but this one sounds fantastic. Lovely trifle! THAT is beautiful, even without it's make-up for the glamor shot. Love making trifles and don't do it often enough. They are so refreshing. Yum! I love trifles, too. I love that the cake has white chocolate IN it. Beautiful!